Do you know Janet Travell? 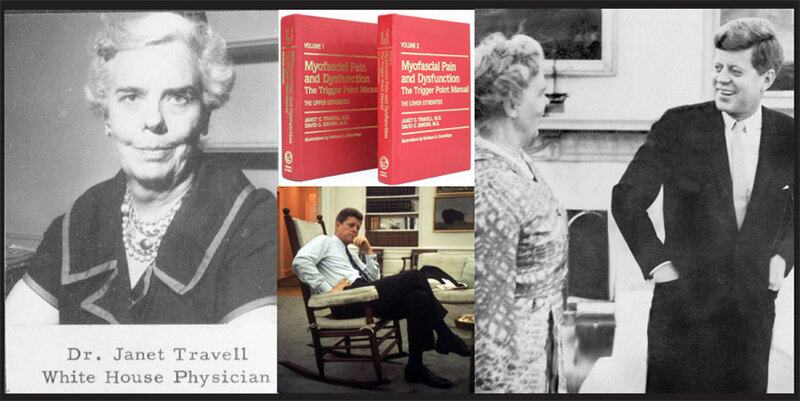 Janet G. Travell, MD was a physician and researcher who helped pioneer the study and treatment of myofascial pain. Travell contributed to hundreds of scientific articles and along with David G. Simons co-authored the two volume Myofascial Pain and Dysfunction: The Trigger Point Manual, considered by many to be the pinnacle resource in the field. Dr. Travell traced her father’s footsteps in pursuing medicine. She studied at Wellesley College and Cornell University Medical College. She practiced in New York City and eventually accepted a fellowship at Beth Israel Hospital where she studied arterial disease and first became interested in skeletal muscle pain. Travell developed successful techniques to accurately locate and treat the sources of skeletal muscle pain. This included the use of vapocoolant sprays, which are still popular today. In 1955, Travell was called upon to treat then Senator John F. Kennedy who suffered from terrible back pain. 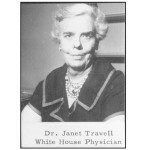 When Kennedy won the presidency in 1960, Janet Travell became the first female to serve as personal physician to the President. Even before her post at the White House, Travell was involved with the design of chairs in relation to musculoskeletal pain. Under her recommendation, the Kennedy Rocker became a national trend. After the President’s assassination, 50 years ago today, Dr. Travell stayed with the White House into the Johnson administration until leaving in 1965. Janet Travell died in 1997 at the age of 95. In addition to her presidential service and extensive writing and teaching, she was hugely influential to massage due to her accomplishments developing knowledge and treatment of Myofascial Pain and Trigger Points.